For Mother Angelica boldness is a virtue. No place is this more evident than in Mother Angelica’s Little Book of Life Lessons and Everyday Spirituality. In this little treasury of Mother's teachings, in her typical bold and surprisingly gentle manner, Mother tells the Christian what the Christian needs to hear and not what the Christian wants to hear. Editor Raymond Arroyo took great care in selecting quotes and passages to put into this little book of Mother’s teachings. 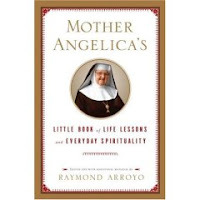 In plan and simple English, Arroyo sets forth Mother’s spirituality and view on the Christian life using her own words from never before publicly released material. Mother’s words might be simple and plain – and at times comical– but there can be no doubting the truth and profundity with which she speaks. Although Mother uses simple language to express her teachings, this only reflects one of her views on the Christian life as found in this book: that the Christian life is simple. Moreover, the ease of language Mother uses, which adds to the accessibility of her lessons to the common person, also reveals another of her principles for the Christian life: that being, Christianity is for everyone: young, old, smart, simple, sick, and healthy – and she has a lesson for each delivered in a manner that can be understood by all. Because of its easy readability, this book will make an excellent gift for those adults who recently entered into the Catholic faith. It will also make a great gift for the recently confirmed teen. Mother's Little Book can be finished easily in a couple of sittings—as I did while recovering from surgery. It is perhaps best read slowly, in short sitting reading only a couple of Mother's teachings at a time. By reading the book in this manner, it will allow the reader to reflect upon Mother's lessons throughout the course of a day, which if taken seriously, can prove beneficial to the spiritual life. I personally enjoyed the book, and I already have plans to reread it but with greater care this time, as I found Mother’s words to be very insightful, inspiring, and challenging. In short, this book is like having Mother Angelica in your pocket, on your bookshelf, in your purse, or where ever it is you keep this book. It is like having Mother close at hand. Truth speaks louder than any ideology, and Catholic spirituality is universal, so there is no doubt that people from all walks of life, from Catholics to non-catholics, and from charismatic to contemplative who won’t benefit from this little treasury of Mother’s wisdom, wit, and life lessons. -Reminder of who we as Christians are and what we are doing. "Don't be afraid to be frustrated. Look at me, I take a lot of Maalox. Somebody said to me not long ago, 'I'm surprised that a woman of such great faith would have to take Maalox.' I said, 'My friend, my stomach doesn't know about my great faith.'"